Tibet developed a manorial system, around 1500 I think, strikingly similar to the European one (and dissimilar to the Chinese landlordism system). To an even greater extent than in Europe, manors were monastic estates (although some were secular aristocratic holdings). In practice, Buddhist monasteries were quick to kill anyone who was not extremely nice (because aggression is inimical to Buddhism, don’t you know). I expect this had consequences. I have been wondering for some years about whether there was some shared enabling technology that allowed the development of Tibetan manorialism roughly around the same time it was at its height in Europe; or what. ah ha! very interesting! thanks! i shall have to read up on the tibetan manorial system. i came across a funny little reference a while ago about when the jesuits arrived in tibet how they found that everyone was marrying their cousins (in lhasa, anyway). tibetans certainly don’t anymore. maybe the buddhist monks and their manors did something about the cousin marriage, too, in a similar way to what happened in europe? dunno. Further Research is RequiredTM! well, it certainly would if it happened long enough and/or with enough intensity. huh. dunno about that, either. will keep an eye out for anything on it though! Hmm, about Tibetan cousin marriage, current or historical, I know zilch. They do have an interesting system of brother polyandry—quite unusual, I believe. Two (or more) brothers marry a single woman. This has to do with matrilineal land inheritance, if I remember correctly. I found your out-breeding theory very convincing, but im not as sure with this one. For example, how _exactly_ would the manorial system select more for traits such as intelligence than the other systems? Wouldnt being hard working, smart, compliant, etc be more desirable from an evolutionary standpoint in places like china where citizens were culled often? other issues- why does Finland, which lacks the manorial system, have higher IQ than the other countries you mention? Why does east asia also have higher Iq? i think that outbreeding may have helped with IQ and especially with the selfish clan vs unselfish nationalist idea. I also think that populations whose ancestors spent significant time in or passing through very cold areas also were more k selected and have higher IQ. for example east asians which traveled across siberia/ central asia, and also how the more cold you get in europe, iq is greater. perhaps also neaderthal % is important. But i cant accept this just yet. I think that things like the industrial revolution and other improvements that occured largely within the Hanjal line were the result of either systemic (is that the right word? I mean within an economic sense) differences such as the west’s greater presence of merchants. Personal incentives for inventiveness or improvement might not have been the same in East Asia. *also, the nobles, who are descended from a warrior class, surely were selected for in this environment? Unless you are implying that being a warrior or descendant thereof was relatively less selected for in the manorial system? For instance, I am remembering a study where wealthier English were heavily selected for, and have left an outsized effect on the gene pool. the same effect would theoretically apply to nobles all the way back to the medieval period. oh, absolutely! and the chinese, along with other northeast asians, do have a very high iq and are very compliant. there is more to one way to skin a cat, though. and remember, most importantly: there’s more to human biodiversity than just iq. yes, intelligence is extremely important. but other behavioral traits are also very important. northeast asians may have a higher average iq than most european populations (except for ashkenazi jews), but they didn’t go to space first. a cooperative nature and universalistic outlook can sure get you far. Thanks for the response. So if I understand correctly, you are saying that almost everywhere there was outbreeding, there was also manorialism. But if the distribution of IQ’s matches the hanjal line, this doesnt necessarily mean that both effected IQ. Manorialism could easily have been just a cultural after effect of frankish origin that didnt greatly influence selective pressure. You say we diverged and industrialized first, which was caused at least in part by a “cooperative nature and universalistic outlook.” But then, if you dont mind, my question would be how EXACTLY does a manorial system select for cooperative nature and especially universalistic outlook more than imperial chinese farming system? People in China working together on a rice farm have a better chance of surviving by cooperating same as on a manor. And I fail to see how a manor selects for universalistic outlook in anyway. As well as cooperation and universalistic outlook, there are plenty of other equally probable theorized cultural traits that may have caused the divergence. For instance, individualism seems to be an important trait that europeans had to a degree that east asia lacked. And outbreeding it seems to me, CLEARLY selects for individualism. For me, coming from Poland, there is another interesting thing. In Poland, there was HUGE fraction of population which was of “noble” descent, probably largest in Europe (25% or something like that in some regions! thought it is disputed by some). Moreover, nobles eventually all became polonised, while peasants quite often were from ethnic minorities (so the fraction of nobles in Polish ethnicity will be somewhat higher than suggested by the fraction of nobility in PLC). So you have a situation in which one part of population is selected for one thing, second part is selected for something else, and because of absence of no strong state, there barrier between those two classes are porous (pourous?… eee leaky). Would those two selection pressures just cancels themselves out? I am of course descendant of noble families, and my ancestors were spending their times oppressing poor Belarussian peasants. “…or even farther back to our common origin with other apes and even other social mammals, lizards, fruit flies, tomatoes etc., etc”: I used to know a chap whose descent from a limp lettuce leaf was pretty obvious. By the time of the Parliamentary Enclosures (18th & 19th centuries) the strips were often owned by the peasantry, so they were keen on the re-organising of holdings to give them compact farms. At the same time the Common Land would often be divided up among the commoners; some land would typically also be given to the local Church “living” as compensation for tithes forgone. Naturally people would be keen to receive their compensation for loss of common rights as a parcel of land that abutted on their newly compact farms. It’s my impression (no expert I) that the Commons that were enclosed were typically pastures and rough grazing; woodland was often retained in common, since it needs a whale of a lot of effort to clear woodland for the plough. Eventually woodland would become less valuable (cheap coal) and more easily cleared (steam power), so then I suppose more would be divided up. I presume the evolution of a land-owning peasantry took quite a while. 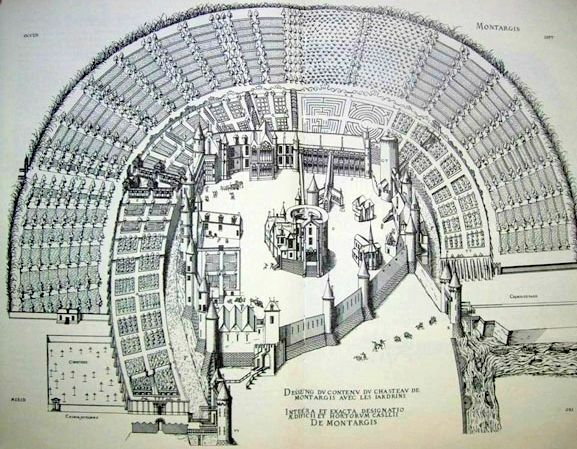 Of course, there were large chunks of England where there were no Parliamentary Enclosures – presumably they already had compact farms, either by earlier enclosure, or by never having the “big field” system in the first place. Rackham is very interesting on this sort of thing. One of the simplest models of directional selection, truncation selection, where the bottom (or top) x% for a trait fail to reproduce is easy to model and produces something that closely fits observed situations. R = response to selection (mean of trait in following generation. S = selection differential (mean of trait of parental population). h2 = additive heritability of trait. If we assume those 1 s.d. below average fail to reproduce, then the mean of the parental population (assuming trait in question is normally distributed) is the mean of truncated bell curve cut at -1 s.d. which you can find (with some witcheryfancy math) to be +0.29 sd. 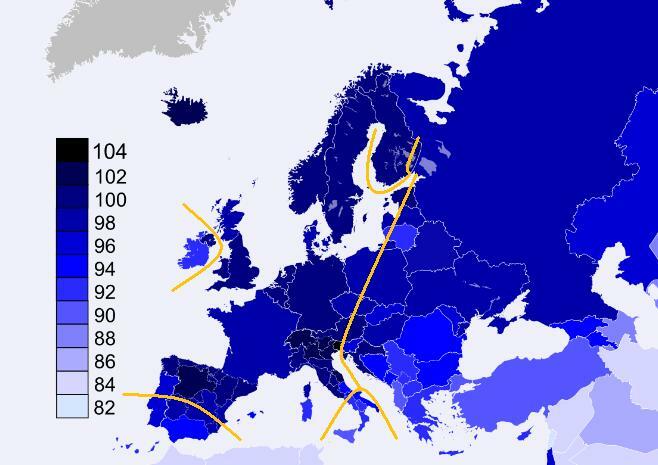 Many European countries appear to have distinct regional variation within them. Almost all of it corresponds to some historical circumstance, and the spread of manorialism is a big one. (Of course, here there might be a racial/ethnic element: more Mediterranean in the south, more Germanic/Celtic in the north). I always wonder about poor Portugal in all these discussions. I see much data on north-south variation there as well, but what parts of that country was under the manor? Good spot for Germany (and all the regional variation there), as well our returning champion, Italy. Great to see you posting again! I especially appreciate your enumeration of the defining features of manorialism, which were a little hazy to me. Makes it much easier to understand why the various personality features you enumerate might have been selected by them. 1. The English word “lord” derives from a Medieval English word “hlafword” (sp?) which literally translates at “loaf keeper.” To me this suggests that lords originally controlled the grain — i.e., that their little domains were far more centralized originally than the later manors, much as the early city states with their central temples were in ancient Mesopotamia for instance. In other words manors gradually emerged though a process of devolution. Is there any evidence for this? 2. My second question as to do with the so-called arenda system in early modern Poland and Ukraine, under which Jews were hired by absentee Polish nobility to manage (or sometimes lease outright) their estates, which were worked by peasants. How did these estates compare to manors? I’m thinking not closely since there were fierce uprisings in which Jews and Polish nobility were slaughtered indiscriminately, which we don’t see much in NW Europe (the peasants rebellion in England, for instance, was small potatoes by comparison). I also find it interesting that serfdom came very late to these areas — peasants actually lost rights rather than gained them — right on up into the 18th and 19th centuries. That seems counter to developments in western Europe. There’s a fourth selective factor that acted here, in addition to manorialism, outbreeding itself, and the above mentioned state pacification: Gregory Clark/Ron Unz selection. Europeans and to some extent East Asians aren’t primarily descended from the warrior noble class: they are descended from yeoman farmers. The warrior nobles used to kill each other on a fairly regular basis. Over time, descendents of the best-performing farmers would come to place both the noble classes and the lower classes (there was a recent paper on this, I’ll have to dig it out). Working with whom? In China, you worked with your family: other members of your clan. In NW Europe, you had to work with non-relatives. The former allows kin-selection to operate. The latter would seem to select for reciprocal altruism (not based on kin-selection). Universalism could be a natural outgrowth of reciprocal altruism. It may arise from generosity: the willingness to extend the first favor in hopes of having it returned later (since it often was). When everyone is a potential helper, it pays to be generous, so long as your generosity is rewarded with reciprocation. “It’s my impression (no expert I) that the Commons that were enclosed were typically pastures and rough grazing”: silly me. They presumably split up Common meadows too. I like this idea that manorialism selected for non-kin cooperativeness. Though, maybe someone could object that fairly high non-kin cooperativeness must have already existed otherwise manorialism would have never got going, spread, and endured. As for other sources of medieval selection, as well as outbreeding, the death penalty, and survival of the wealthy, l want to suggest that the Little Ice Age (1310-1850) probably had an impact. Populations had risen 3x in the Medieval Warm Period (800-1250). This is when NW Europe including Scandinavia starts to rise in importance. But then in the Little Ice Age there are cold winters, grain yields fall. Cold winters select for intelligence, foresight, cooperation. People bred new grain varieties that began improving yields. We probably also bred new human varieties. I’m a newby to this blog, and playing catchup, but the ideas and theories espoused by HBDchick are well-reasoned and persuasive. The evolutionary path bias caused by manorialism is likely to be both genetically based (gene encoded behavior) and also memetically based (meme encoded behavior). In particular, the overlay of religious doctrine and selection pressure also acts to reinforce these traits and provide continuity over time via indoctrination of youth. Systematic brain wiring via memetic coercion is an evolutionary speed enhancer. Careful with that. “Meme” encoded is mostly (though not entirely) BS. Meme encoding is not the equivalent of DNA strand encoding. It primarily refers to developmental neural pathway modification as a result of environmental factors, including language based indoctrination. Persistence across generations is also frequently achieved via long term environmental factors, including dominant social institutions (particularly religious practices). DNA encapsulation of these traits is a lagging phenomenon. Like I said, it’s mostly BS. @ Whyvert – “I like this idea that manorialism selected for non-kin cooperativeness. Also I wonder about selection for lactase persistence alleles among populations in European regions with good pasture land which practiced dairy farming from very early on. Perhaps this led to more frequent outbreeding as a result of higher population density due to better nutrition/better immunity/lower mortality. Greater outbreeding coupled with lower rates of iodine deficiency led to higher average iq? Pure speculation on my part though. I do not posses extensive knowledge of medieval times but I can tell that in some parts of (slavic) eastern Europe ecclesiastical manors we common. I live in a village founded in 11th century (if I remember correctly) by a diocese, and owned by it, of course. Beginning of the eccesiastical manor system in my country can be traced to 9th/10th century. good to see you posting again. speculative and hard to test, still glad to see you working on your ideas. having lots of unrelated individuals together could exactly select for trust and abilities at fictive kinship. on the other hand, I also suspect if unrelated people are more likely to exploit one another, it might instead select for suspicion, lower levels of honesty-humility / higher levels of individualism. people who are surrounded by their trustworthy relatives and friends, who won’t exploit them, might instead evolve a tendency towards trust. being around unrelated people who are coerced into being around you might select for tolerance though – if they’re not going to do much for you (they’re not freely associating with you, nor are they your relatives), then you might evolve towards having realistic expectations of them, rather than towards being vengeful when they let you down. northwestern europeans seem to have rather low expectations of what people who are not their family or part of a group of people freely associating with them should act. people should pay their taxes, support the state, and are not sociable with one another outside formal clubs and “civic organisations”. perhaps because their evolutionary experience includes more unrelated people coerced together than is today the rule, leading to a certain interpersonal sangfroid and tolerance and low levels of shaming. a strong psychological bias towards interactions where others are peaceful, but because they aren’t relatives or friends, they don’t really give a sh*t about one another. people don’t socialise easily so form a lot of subsocieties which bind them together under a phony shared purpose (thus high levels of civic “engagement”, while having the largest zones of personal space in the world and perhaps the lowest willingness to actually talk to a stranger you meet on the street). compare some other agricultural societies – if you’re surrounded by your relatives and if not them, by friends, maybe it was worthwhile for you to be warm to them, and worthwhile to give them a good tongue lashing to exploit their sense of honor and shame when they failed to honor you. the complex of interpersonal warmth, revenge, honor and shame. I mean, a priori, corral a bunch of unrelated people onto an authoritarian version of a kibbutz, threaten them with the chop if they step out of line or try to leave, set up a situation where the one who pleases the big man the best gets an advantage (its not your bottom line rent payments that matter, its your perceived productivity), don’t police too hard how they act to one another except as it effects your bottom line. What kind of personalities are going to do thrive in that situation? I doubt it is all, or even mostly, bad, but I could see dark side selection there for sure. “Europeans … aren’t primarily descended from the warrior noble class: they are descended from yeoman farmers”. I wonder who the yeomen farmers are descended from? Why is it the case that English serfs in the early Middle Ages didn’t own land, and yet by the 18th and 19th century many of the strips were owned by yeomen? Are the yeomen descended, many of them, from the Lords of the Manor rather than from his serfs? Surely the squire would try to provide for his surplus children, his nephews and nieces, and so on. Even if the Lord of the Manor was no mere squire, but a nobleman or Abbott, the same might be true. Or if not descended from a nobleman or churchman, descended from his steward who ran his estates for him. Or is it just the case that the shortage of labour after the Black Death made Lords of the Manor try to attract or retain labour by granting ownership of strips? Are there any records that throw light on this? Surely there must be. I’ll bet if that’s what happened they’d try to be selective about the peasants to whom they granted ownership of strips.They’d opt for steady, healthy and sensible blokes, people who’d impressed them at the Manor Court. Wouldn’t they? The homicide rate map is interesting. Significant west-east gradient. And Russia stands out. This is going to be an epic series of posts! It is also interesting to think about, as were the social conditions of the barbarian tribes that invaded the Roman Empire and considerably changed the ethnogeographic landscape of regions that were part of the Roman Empire, like Galia. I saw a documentary about the Celts. Unlike the myth propagated by the ” civilized people ” of the Mediterranean, the Celts lived in peaceful societies with less social verticalization of the Roman Empire and with greater equality between genres (specially if compared with romans). Assuming for the sake of argument this was true or partly true then a couple of thoughts spring to mind. 1) If the people who moved to the new manors weren’t already partially pre-adapted for manorial life then then they might have still existed if there was a technical reason for them to exist e.g. sharing the number of oxen needed to pull a heavy plow but the form might have been very different i.e. more of a gulag farm (as suggested above). 2) My understanding is part of the technical foundation for manorialism was the heavy plow and the need to share the cost of the larger number of oxen needed to pull it hence its concentration in areas with the kind of heavy soils that couldn’t be farmed efficiently for crops before then (so they relied on cows and pigs more instead). Areas that didn’t need the heavy plow didn’t need to manorialise. This implies that a lot of the best farmland (once the heavy plow came along) was not farmed before and a lot of it was forested hence a lot of manor settlements being *new* settlements carved out of the forest – which is apparently what happened. So you might have standard clannish villages scattered around with new manorial settlements springing up on heavier soils in between existing settlements in some regions and also along a frontier from the epicenter. My understanding from previous posts is that the owners of the new manors offered inducements to entice volunteer settlers from the pre-existing clannish villages which might act as self-selection for higher than average non-kin cooperativeness among the new settlers. 3) The Finns are an interesting counter example but what if they’re not? What if they had something in their method of food-getting which led to wider non-kin cooperation? 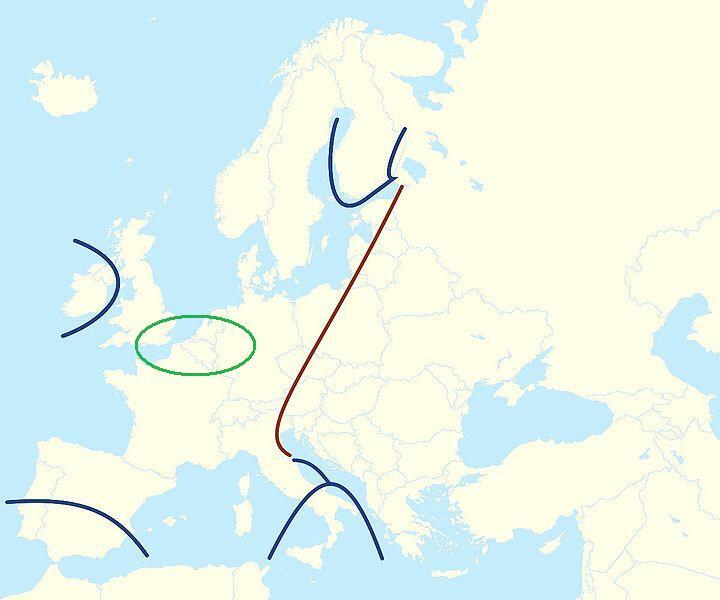 As a lot of the populations on the north European plain may have come relatively recently from regions that used the same method until they moved south this might be another possible route for some level of pre-adaptation for manorialism. Medieval Europe was already modern. Manorial lords in France and Spain but at the same time in the Low countries , northern Germany (Hanseatic League) and northern Italy there were all the characteristic of modernity in those areas, which were all in the Holy Roman Empire.